The site specific installation work There’s Nothing Natural About This by Chicago artists Anne Yafi and Christalena Hughmanick looks at the spacial and temporal relationships between nature, architecture, the body and ownership of space. Yafi’s three-dimensional grid drawing makes subtle attempts in subverting its art historical origin through her use of a tactile craft material (pipe cleaners) and the intuitive application of color, while rejecting a narrative or sequential reading of any kind. Hughmanick’s quilted components take aesthetic cues from the ancient Roman architecture of Aquincum, using its slow deterioration over the past 2000 years to consider the relationship between human building and nature. Material choices reinterpret ancient building material and the level of function presented in the resulting works aims only to be graphic. 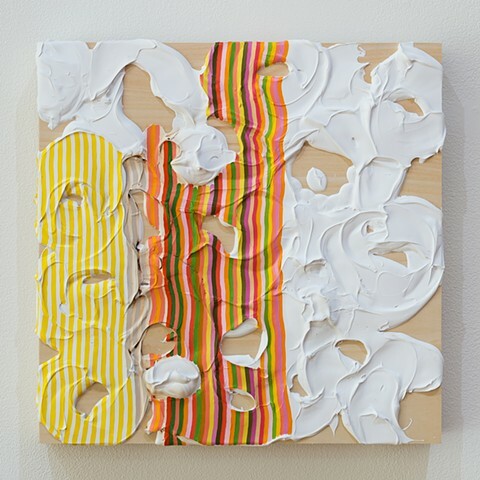 Anne Yafi’s multi-media work exists at the intersection of drawing, painting and sculpture, creating playful works that combine traditional mediums with found materials. Color relationships play a key role in guiding Yafi’s choices with these elements. Op and Pop Art are art historical touchstones, as are the color palettes and aesthetics of Scandinavian Modern design, which Yafi recalls being immersed in during her childhood years. This visual sensibility influences her use of line, pattern and color, as well as informing the restraint that tempers these elements. 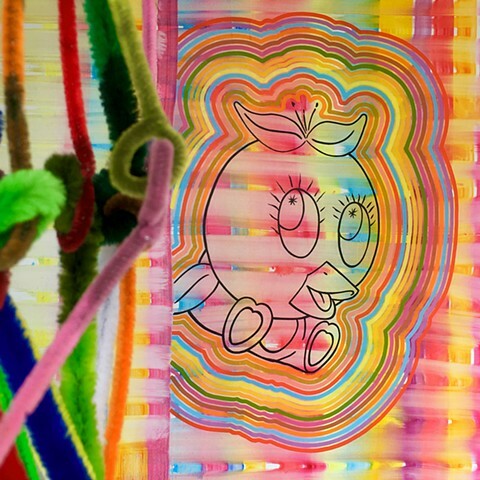 Does It Feel Delicious will present new paintings on panel and canvas alongside three-dimensional works constructed from pipe cleaners. The panel paintings are process-based, beginning with the use of gesso as a textural medium, “creating a topography that would determine, but more importantly - invite a tactile response i.e. mark making. The repetition of painted lines and other markings are a documentation of that process and therefore the primary determining factor in the creation of imagery.” The resulting works exhibit a sensory interplay of color, surface and form, functioning simultaneously as image and object.